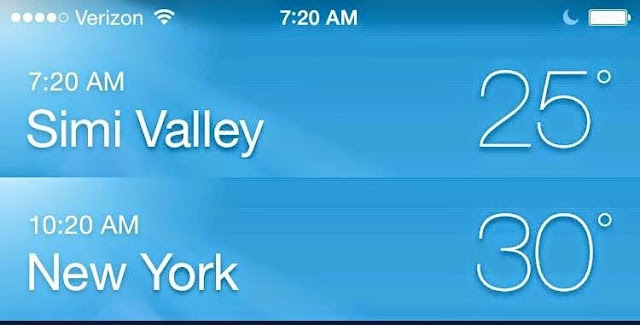 I live in Southern California... we can't claim the extreme weather of a good portion of the nation but we do get weather. So as my friend posted, we were 25* this morning - yikes - and I couldn't resist a post of a snow man as a nod to this chilly weather. This quick and easy hand-crafted Snowman card is simple, elegant and vintage with a touch of texture in the embossed 'sky'. 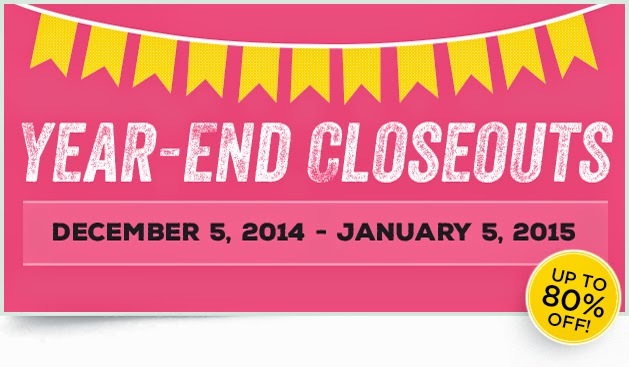 CLICK HERE to see the SAVINGS!! BOOK Your OWN Private Class that will Highlight the card styles or techniques you are interested in! With my designing cards for YOU, Book a FUN Gathering of family and friends to create! From fun Holiday Cards to Celebrations... YOU will earn ALL of the Hostess Benefits on ALL of the Purchases - perfect for stocking up to make hand-crafted cards and gifts!! 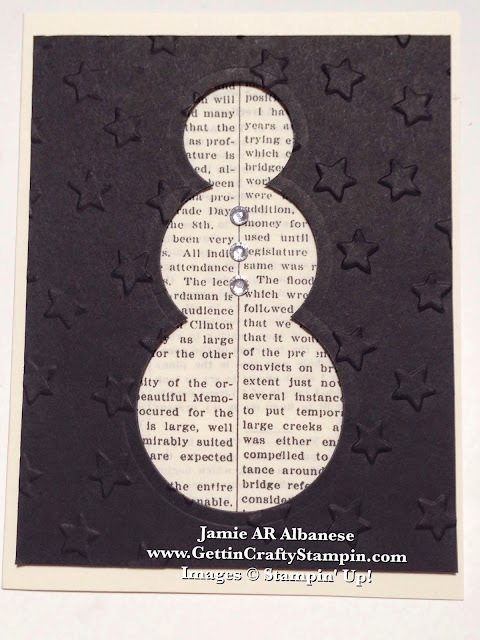 Create this quick die-cut snowman using the Circles Collection Framelits on the Magnetic Platform. 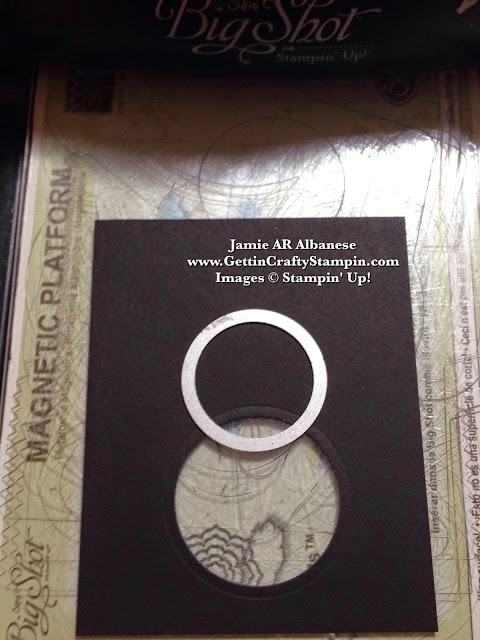 Starting with a 5-1/4"x4" piece of Basic Black card stock. Use the 'base' and the fourth from smallest Circle framelits. Then the next three smallest framelits to create this elegant snowman. 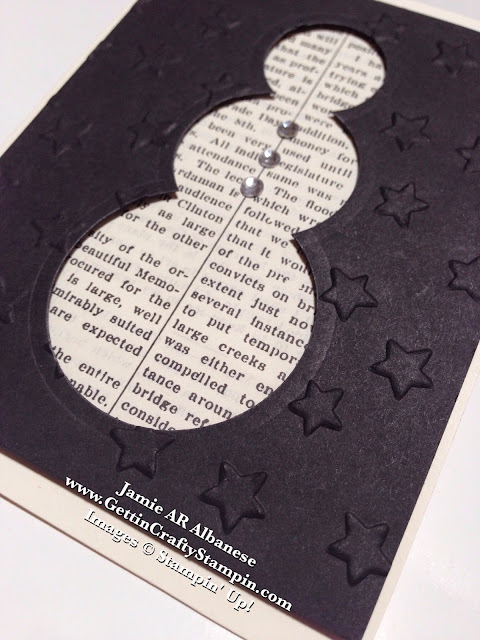 Emboss with the Lucky Stars Embossing Folder to create a 'starry night sky'. I love the subtle look of these embossed stars! Brrrrr - when my friend and stamper Patti posted this on Facebook - I was glad to be (A) in bed at 7:20am (B) wearing my fuzzy jammies and (C) holding a hot Mocha Latte after I did wake up! This January, the LNS blog has a Snowman challenge, too - I love how it all works out - lol. Layer the Typeset Specialty Designer Series Paper under the embossed and die-cut piece using the Stampin' Dimensional Adhesive. (The Typeset Specialty Designer Series Paper is a lightweight, with a vintage feel - just like from the pages of an older book!) I love how it looks on the Very Vanilla card stock base. Adding a pop of bling with our adhesive backed Rhinestone Jewels for a simple but wow element. Simple, clean, elegant, textured and vintage - this easy hand-crafted card is sure to warm hearts on a chilly day! Warm up some hearts during this chilly winter with this easy, elegant and fun hand-crafted card. I love the ease of it, the elegance even. Sending hand-made cards to deliver cheer is one of my new 'goals' of the New Year. I intend to do my part in spreading cheer and love, all year long (and I aim to deliver birthday and celebration cards on-time this year - lol). So Join Me in sending some love and blessings in the mail this year and see what is does to those you care for.